As long as she can remember, Dawn Braasch has loved reading and has adored books. 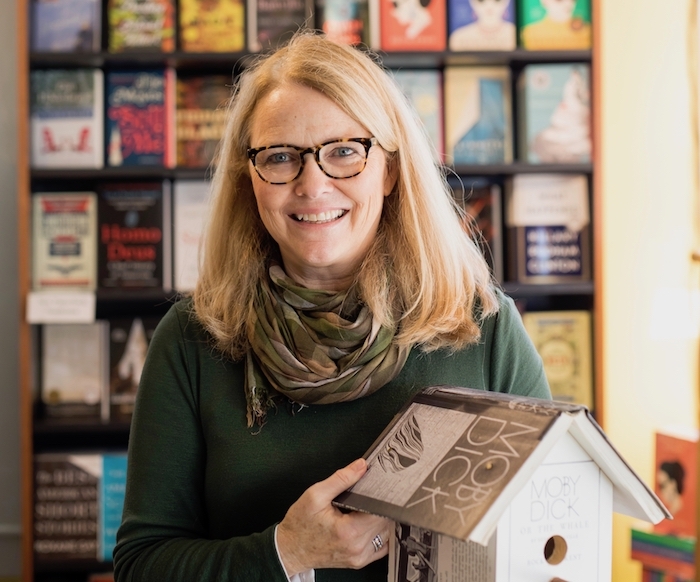 She credits her happy, television-free upbringing in Medfield and Hanson, Massachusetts, where she learned to love the outdoors and to treasure her quiet time with favorite authors. Q. Why did you decide to buy the business? Q. It certainly is a beloved bookstore on this Island. Did that contribute to your decision? A. We are lucky to have a year-round population that really supports us. Literature and reading are prized here, and that is not necessarily true in other parts of the country. A. Oh, that’s easy. As a young girl growing up, my favorite was Louisa May Alcott, because I was Jo in Little Women! Living in the South for a long time, I grew to love Pat Conroy. Greg Iles is a favorite for sheer readability. He’s a great writer and a beautiful storyteller. Coming here, I discovered Ward Just, who to me is one of the greatest living authors. And we’re lucky that we have an embarrassment of riches here: Geraldine Brooks, Tony Horwitz, Susan Branch, David McCullough and Nicole Galland to name just a few. Q. And yet we all read of bookstores struggling due to Amazon and e-books. How does that affect you? A. Well, book-buying is not going up. But I feel we’ve positioned ourselves well [by moving into a smaller store]. Our new location at 23 Main street is a little small in July and August, but ten months out of the year it’s kind of perfect. But yes, the bookselling business is becoming harder and harder. If summer business is down, as it was this year, it really sets the tone for the rest of the year. Q. How important is the holiday season to your business? A. We do two-thirds to three-fourths of our business in July and August. Summer is so frenetic here! The holiday season is like summer, but in a much kinder, gentler way. We love the holidays. We stay open late at night, and that’s great for business. But it’s so much fun for us too because we can talk to our neighbors and talk about books we love. We carry on the Nelsons’ tradition of serving eggnog on Christmas Eve. Ann [Nelson] was kind enough to give me her eggnog recipe. It’s a great time of year. Q. You also stock gifts? A. Yes, we had to do that in response to the downturn in bookselling. I never wanted to be anything more than a bookseller, but there are things that go with books, like puzzles and games. We do a lot with cards, boxed note cards, journals, a few kids’ things. I try not to step on anyone’s toes in the gift business, but having a few gifts allows me to add to the bottom line just a bit. Q. Is there a particular gift you’d recommend this year? A. I’ll tell you the gift that I think is beau tiful. They’re expensive, I won’t lie, but perfect for book lovers. They’re handmade birdhouses featuring old books. They can’t go outside, but the gentleman who started making them rescued books from schools and libraries that were going to be discarded. The top of each birdhouse is an actual book, and then he decoupages the pages around the outside. They’re beautiful. Puzzles and games always do well at Christmas too. Q. What do you want to say to the buying public this holiday season? A. Come in! We have a loyalty program. After you buy ten paperback books, you get 25 percent off the eleventh. After five hardcover books, you get 25 percent off the sixth. We honor the Island Card on hardcover books. I think now more than ever, if you value your downtown, your Main street, then you should be buying local. It keeps your money in your community. I hire local people. I spend my money locally. I don’t go off-Island. I pay taxes, the business pays taxes, I contribute to charities. There are many reasons why I hope people will continue to support us. Q. It sounds like, stresses aside, you love what you do. A. I love walking into the store and smelling the books. I love who I work with; I have a great group of people. I love talking to people about books. How lucky am I, living on this Island, one of the most beautiful places I’ve ever been, and having people come into the store every day and you get to talk about what you love? Paula Lyons is a former ABC and CBS television consumer journalist. She lives in Vineyard Haven. A lovely article about a lovely person!